Here is a list of Most Ports in India which will help you in exams like UPSC, BPSC,SSC MTS,SSC CHSL, SSC CGL,Railways and other Banking Exams like IBPS, RBI, SBI Clerk etc. There are 12 major ports, 200 notified minor and intermediate ports. The Indian Government has allowed Foreign Direct Investment (FDI) of up to 100 per cent under the automatic route for port and harbour construction and maintenance projects. All major ports, except one Ennore Port are government administered. 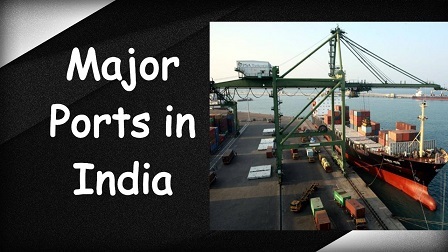 Kandla Port is the largest port of India by volume of cargo handled. Madras Port is the one of the oldest port of India and the second largest port in the country. Jawaharlal Nehru Port is the largest container port in India.